Rivers and lakes and the corridors they occupy have always been travel ways, for many species, and man figured out early on that riding something that floats is often easier than walking the bank. While Egyptians were binding papyrus reeds from the Nile into boats, the Kalispel and Kootenai Indians came up with their own unique water craft, designed to travel Lake Pend Oreille, the Clark Fork and Pend Oreille Rivers, and the Kootenai River to the north. It was very different from dugouts of West Coast natives or proverbial birch bark canoes. On a frame of alder, willow and cedar, the bark of white fir, abies grandis, was secured with root fibers, inner bark out, and cemented and sealed with pitch. These resembled open kayaks, each end tapering to a blunt point that rode below the waterline in a loaded craft. The hulls were somewhat flattened, making the boat wider than it was tall. These small craft plied the lake for centuries, but they disappeared less than 70 years after the first powered boat appeared on Lake Pend Oreille in 1866. 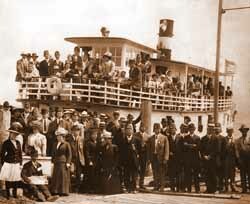 It was then, to take advantage of the rush to Montana goldfields, Oregon Steam Navigation Company built the Mary Moody, an 85-ton, 108-foot-long, steam-powered stern-wheeler at Seneacquoteen, across the Pend Oreille River from present-day Laclede. The Mary Moody hauled horses, mules, men and freight from Seneacquoteen and Pend Oreille Landing (near present day Bayview) to Cabinet Landing, 10 miles up the Clark Fork River. Here, all disembarked for a portage around Cabinet Gorge and Heron Rapids before loading onto the Cabinet to continue upriver. After another portage at Thompson Falls, the ride resumed aboard the Missoula. Mary Moody and her sisters served a decade before they were dismantled and shipped overland to the Columbia River. Then, for five years, Lake Pend Oreille was quiet again. In 1881, however, the Northern Pacific reached the lake, and steamers returned. The 100-foot Henry Villard and the Katie Hallett served the railroad, hauling supplies to the proceeding railhead. As the railroad brought people to the area to stay, boats on the lake proliferated. Newspapers of the day are filled with accounts of new boats, old boats and rumors of boats. In 1903, the Flyer ran aground in a fog near Glengary and split her bottom open. It was an exhausted crew that nursed her into Hope the next day, having bailed all the way home by hand. In 1905, Eagle was proposed by Sandpoint Navigation and Transportation as a 92-foot, double-decked stern-wheeler with a 75-horse engine, capable of hauling 300 passengers warmed with steam heat. As built, Eagle was 80 feet, carried 20 passengers, had a 12-horse engine. Eagle navigated the Pend Oreille River between Sandpoint and Priest River for a year before she sank. Sandpoint Navigation and Transportation sank, too. Not so with the Northern Navigation Company. With Frank Yokam, R.E. Smith and E.J. Elliot as officers, Northern Navigation dominated lake transportation for 30 years. By 1909, their flagship, Northern, carried the mail and offered daylong tours of "the most beautiful scenery in America." Queen of the lake for 20 years, the102-foot Northern carried 250 passengers, and hauled mail and freight from Bayview to Sandpoint, with stops at Lakeview, Granite Creek, Midas (now Garfield Bay), Glengary and Hope. The Northern burned in 1928 and was replaced by the Defender. Her flat hull proved impractical and dangerous on the choppy lake, so she was replaced by the Western, which served until 1937, when completion of a highway around the lake brought steam navigation on the lake to an end. The Western, and all she stood for, was stripped of engines and hardware, towed out into the lake, and burned. Northern Navigation moved to Priest Lake, where, over the next decade, tugs like the Ridley and Tyee towed millions of board feet of Diamond timber down the lake to be floated on the spring floods down the Priest to the Pend Oreille, bound for the mill at Albeni Falls. During the reign of the steamer on the rivers and lake, over 80 steam-powered ships and boats plied the waters with names like Mudhen, Ponderay, Rustler, Flyer, City of Hope, Mountain Belle and Edith May. They took every shape and size, from the 25-foot open excursion boat Echo to the mighty Dora Powell, an 80-foot steam tug that pushed barge-loads of limestone mined at Lakeview to Bayview to be kilned for use in cement. The beginning of the true gasoline age on Lake Pend Oreille was about 1930, but gas-powered boats were on the lake before that. One was an open wooden boat with a single-cylinder Fairbanks motor and a top speed of 7 mph; often operated in 1921 by a young man who might have had trouble picking up the motor: 10-year-old Fred Kennedy. Kennedy would grow up to become one of the most enduring forces on Lake Pend Oreille, and one of its most knowledgable workmen. Kennedy dominated commercial transportation and construction on the water from the late '40s until he sold his company in the '80s. His boats towed the last brails of logs from the gathering yards at Pack River and Lightning Creek to the sawmill at Albeni Falls, threading mile-long trains of logs through no less than six bridges. He also helped build both long bridges south of Sandpoint. Born in Julia, Idaho, and raised at Sandpoint, Kennedy played football with distinction and was elected to the Shrine All-Star team in 1930. He built his first boat right out of high school, named her the Lottie May, and married his girl, Charlotte. Nickname: Lottie. Lottie May would become his first tow boat. Kennedy spent World War II at Fairchild Air Force Base patching up bombers, including the famous Memphis Belle. After the war, he came back to Sandpoint and bought the local marina, located where the breakwater in front of Edgewater Resort is now. Eventually, he bought what is now The Old Power House, at the mouth of Sand Creek, and moved the marina there. Soon, Kennedy came to be known for his ingenious ways of getting things done around the lake, and he spent 40 years contracting to the likes of hydro-power provider Washington Water Power and the Navy submarine testing base at Bayview. In fact, it is his simple, effective design, built in the '50s, that is used to help test submarine hull design today. Now 86, Kennedy resides at Hope, in a modest house a football field's length from the lake. Parked at the shore is his summer "home-away-from-home," a steel-hulled barge of his own design he can drive his motorhome onto for adventures around the lake. The barge is powered by a 200-horse Volvo engine and features an automatic pilot that will "take me right into Sandpoint." Kennedy remembers the Northern and Western, and a lot of other boats. He's had his share of them. His favorite was the Lottie May, but he also remembers Black Maria, a fishing boat with a tarred black bottom and a little two-cylinder motor. "Boats nowadays have so much power, I think they scare the fish away. Black Maria, fish couldn't hear." He is right about power. Today, we have boats on the lake that will exceed 80 miles per hour and 40-foot Bayliners with twin 200-horse marine engines. There are also 12-foot Alumicrafts with 5-horse trolling motors and everything in between, including those pesky little water-skeeters known as personal water craft. Sandpointer Sandy Compton is author of Caleb's Miracle and Jason's Passage.